The location was in the drive entrance to a small but very nice hotel in Springfield, Virginia. The "Take It!" Came from the simplicity of this plant arrangement being framed in the sunlight streaming through a skylight in the roof above. The framing is not quite symmetric - but somehow there is an unexpected centeredness about this. I sincerely doubt the plant barely seen in the right side of this photo ever becomes the lit up star of the driveway the way this one does. The After Take: To those that I have shown this to - the reaction was not quite as enthusiastic as mine - but that is ok, for not everyone likes the same kind of eye candy. Part of what made this jump out at me - was that there were not any people in the picture to distract from the completeness of the sun square. I have a little palm that looks very similar to that. Its getting its time in the spotlight! Center Stage. I actually like this photo. There is a lot I see here. 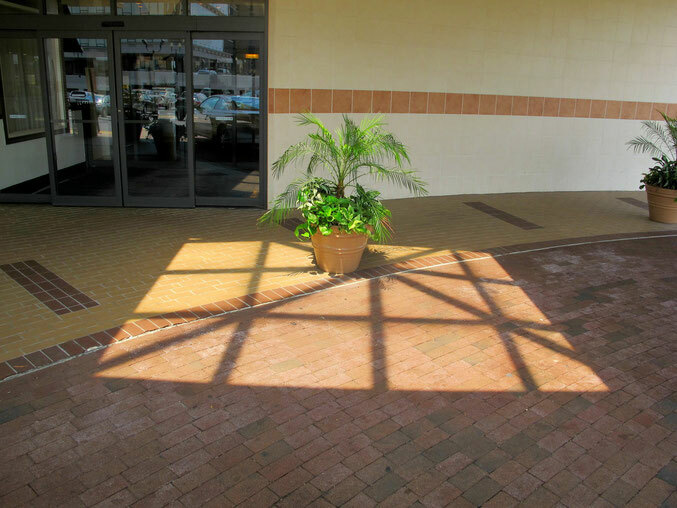 My comical side sees a plant waiting to play tic tac toe on the floor. The squares from the sun being the board. The plant getting its time under the sun while another plant off to the side waits in line. Put a water pitcher next to it and its got a nice little vacation going. The image does seem centered to me too, interesting. Good catch as always! Have a good day.